On a cycling trip around beautiful P.E.I. and new appreciation for each other. When I first suggested a mother-daughter biking trip in Prince Edward Island, my 16-year-old Dancing Queen was surprisingly enthusiastic. Then she wavered. "On one condition," she said. I waited with trepidation. "That I can listen to my Walkman while riding my bike." Hey, no problem. She could bring as many dance and rap tapes to PEI as could fit into a cycling saddlebag. 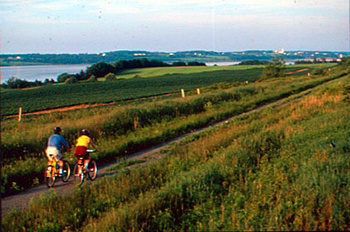 For on this picturesque island, the new Confederation Trail is made up mostly of abandoned railway lines. No noisy trucks would be bearing down on us. The pathways are soft crushed gravel, easy to ride on (or gentle if you fall) and mostly flat. It was ideal. Best of all, the Trail passes through towns and villages so we would always be close to civilization. If we needed water or emergency fresh batteries for the Walkman, or even a seafood chowder lunch, we could easily stop. Of course, we could not ride the entire tip-to-tip distance in four days. Yes, biking clubs in scary helmets and neon suits race the 270 km from Elmira in the east to Tignish in the west on long weekends. But we non-biking city gals would pick recommended bits of the Trail to leisurely explore. Only one question remained. The PEI Trail was ready for Natalie. But was she prepared to spend evenings with mom instead of rushing off to dance to the beat? 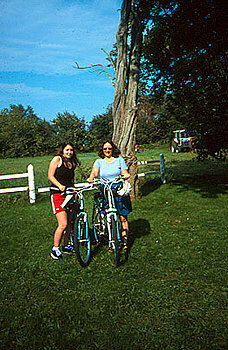 Nevertheless, with Natalie's silver spandex and high boots temporarily replaced by shorts and running shoes - and with enough dance party tapes, U2 CD's, and jungle music mixes to last for days - we landed on the PEI shore. We stopped in Charlottetown just long enough to see another dancing girl - Anne of Green Gables at the Confederation Centre. Then we set out, music blaring from the tape deck, for Mount Stewart to pick up our bikes before heading for one of the most scenic parts of the Trail. Sure enough, Douglas Deacon was waiting for us at the Trailside Inn, a kind of down-home cozy café with a few simple guest rooms upstairs. Most of Deacon's customers are baby boomers and he knows why they keep coming back. "When the roses are in bloom and grasshoppers and butterflies are flitting about, it's like a scene from Mary Poppins," he exclaimed. "Add in the bird sightings - while you're having morning coffee, you can watch a hawk or an eagle - and it's a National Geographic moment." Choosing two Giant five-speed models, he fitted us with helmets, attached an easy-on easy-off bike rack to our car and waved us off. "Just call if you get into trouble," he shouted. We definitely had no problem finding the beginning of the trail that runs from Mount Stewart to St. Peters. Soon, we were cycling along the ocean under a glorious sky. Veering north and wheeling along the shore, we rode through fields of wildflowers and passed the salt marshes of the bay. I wondered about the lines of stationary white birds lined up in military-like rows. They turned out to be mussel markers, signs of the flourishing shellfish industry. For most of this 22-km section, Natalie was way ahead of me, beetling along with headphones firmly attached. When I finally caught up to her, she explained, "I was dancing to the music as I was riding along." Obviously, jungle rhythms were conducive to pedal power. We took a lot of water breaks to watch the "action." Great blue herons swooped down to catch fish. Shorebirds chased each other along the sand. Sitting on a bench overlooking the ocean, Natalie started to ask questions. "Why is the sand so red?" (The iron oxides in the soil.) "Can people actually make a living from fishing for mussels? And why do you think it's so peaceful here?" I could see that the Island was beginning to exert its magic. In St. Peters, we stopped for a late lunch at Rick's Fish 'n Chips and Seafood House, before heading back and over to the amazing dunes of Greenwich, Prince Edward Island National Park, by car. Deacon was right. With church spires popping up over luscious views of the bay, birds circling overhead, and green and yellow fields mixing with the white and blue of the ocean, this was a page from National Geographic in 3D. Over the next few days, we biked other sections of the Trail: to Montague where we swam at Panmure Island Provincial Park; and from Murray River to Murray Harbour where we chugged out to a sandbar to see the island's largest colony of 300 seals, some weighing up to 1000 pounds. In Montague, at the historic Lady Catherine's Bed & Breakfast, Natalie cracked open her first lobster courtesy of Innkeeper Tom Rath, who served exquisite dinners to tired bikers. "You can't say to a cyclist who's just arrived that the nearest place to eat is 22 km up the road," he joked. In the morning, his "skip-lunch" breakfast of blueberry waffles and blueberry lime preserves was accompanied by Celtic flute music - a nice change from our usual booming-beat tunes. The August weather was perfect for cycling and swimming. So occasionally we ditched our bikes to explore the sand dunes and the beaches. On our last day, we veered away from the east and headed west to Summerside where the Trans Canada Trail was born. In the Rotary Friendship Park, we found a plaque commemorating the 1994 beginnings of setting aside green space for the Trail. Bravo to this group and to PEI for being the first to finish their part of the Trans Canada Trail. We attended a rollicking evening ceilidh of bagpipe music and fiddles at the College of Piping and Celtic Performing Arts. Natalie figured she would only stay a minute. But there she was at the end of the evening, not ready to sign up for step-dancing yet, but happily entertained by the fiddling and fun-loving atmosphere. Before heading for the airport, we set out from the backdoor of our Willowgreen Farm bed and breakfast for one last cycle through rolling meadows and golden fields. The outcome after four days of togetherness? I learned a lot of the lyrics to today's music, whether I wanted to or not. And Natalie learned how to encourage her mom when the muscles ached. We learned how to pedal against the wind. And how to stop and smell the roses and the sea air. Natalie's only complaint? Too many grasshoppers jumping up at her legs as she cycled. If that was the week's biggest problem, then our biking sojourn was more than successful. And as for mother-daughter evening activities? After a day of cycling and a seafood dinner, we were both keen to crawl under a fluffy duvet and go to sleep. No talk of dance clubs, discos, or dream dates other than the one with the bicycle the next day. 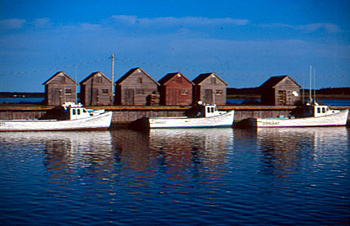 Signature Vacations offers weekly flights from Toronto to Charlottetown, July 2 to September 3, 2001. There are also flights from Toronto to Moncton. From Moncton you can drive to the Confederation Bridge. Roundtrip from $502. Signature's five day/four night Pedal and Paddle PEI or Bike PEI packages includes Guiding services, shuttle transportation, expedition equipment, most meals and accommodation at local inns. The cycling is moderate, about 21 to 50 km per day with some hills. Prices start at $1429 per person double occupancy. Contact your local travel agent. 122 North River Rd., Charlottetown, PEI, C1A 3K. Former home of the late Premier Joe Ghiz, restored to 1852 glory. Swimming pool. Rates from $125 for two, home-cooked breakfast included. 109 Main St., Mount Stewart, PEI, COA 1TO. Former General Store serves up excellent clam chowder, home-made desserts, oysters on special nights and local live music. Open mid-May to Canadian Thanksgiving. Room rates at $80 single or double include continental breakfast. A farmhouse setting just behind the College of Piping and adjacent to the Confederation Trail. Rates start at $50 per person, breakfast included. Weekly rates from $300. Victorian farmhouse overlooking Northumberland Strait, gourmet seafood dinners available as well as farmhouse country breakfasts with homemade muffins and Island preserves. Rates from $60 per person. 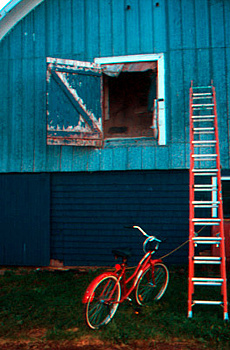 You can rent bikes at the Trailside Inn (about 20 minutes from Charlottetown). Bike rentals (helmets included) from $17 adults, $10 kids for half-days ($25 and $15 daily). Tag along bikes, tow-behind trailers and baby seats are also available. Call 1-888-704-6595 or 902-676-3130 For cycling tour packages or rentals, contact MacQueen's Island Tours Bicycling Specialists. Tel. 1-800-969-2822 or visit www.macqueens.com). Daily rates start from $25 adults, half-price for youth, $20 for child trailer or Trail-a-Bike. They also offer luggage transfer service and/or guided and van supported itineraries. To book tickets for the summertime Charlottetown Festival (and yes, Anne of Green Gables is playing between May 30 and October 13 as well as other shows), call 1-800-565-0278 or visit www.confederationcentre.com. Call 1-888-PEI-Play or visit www.peiplay.com. For accommodations vacancy information, call 1-888-268-6667.